Marelle Taylor Stampin' Up! Demonstrator Sydney Australia: Come and Meet the New Colours! Come and Meet the New Colours! Our new Catalogue is just around the corner, and rather than having one big bash, this year I've decided to host a series of Mini Launch Parties ...actually, they are more of a cross between a class and a launch party! 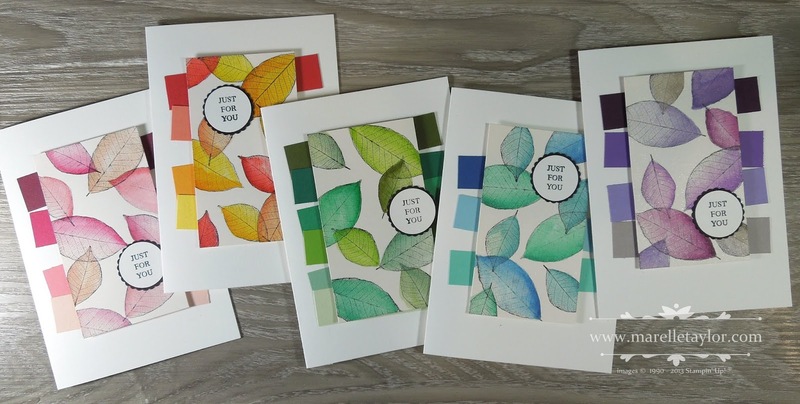 We'll be making these 5 cards and matching envelopes, you'll get to play with ALL the new colours and make a colour chart to take home, you'll receive a handy Colour Inventory, and there will be cupcakes and champagne to welcome in the new Catalogue. You can also pick up your copy of the Brand New Annual Catalogue! There will be lots of special offers, we'll play a game or two and you'll have a chance to win a Lucky Door Prize. There will also be a thankyou gift to take home! Don't miss out on this fabulous event. Bookings are essential, and places are limited so RSVP by June 8 to mail@marelletaylor.com.